Choose free Corn & Beans quilt patterns to create a stunning quilt that uses only three colors. 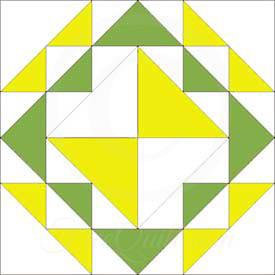 Traditional Corn & Beans quilts use white, gold and green, but you can use your imagination to make a contemporary, updated version of this popular quilt pattern. Use a rotary cutter to cut your triangles perfectly, and learn how to assemble your triangles in sub- assemblies to save sewing time. Use plain blocks of coordinating fabric to make a checkerboard appearance and cut your sewing time in half. Corn & Beans quilts are made of three sizes of right triangles. You can alter the size of the pieces to create blocks of different dimensions to suit your needs. The easy-to-do patterns come with materials guides and tips on how to piece your quilt quickly. Click on image to print the 6" block of the Corn & Beans quilt pattern.